The cornea is the clear front window of the eye. It covers the iris (the colored portion of the eye) and the round pupil. The cornea is composed of five layers. The outermost layer is the epithelium. When the epithelium does not adhere correctly to the corneal tissue below, this can cause a condition called recurrent corneal erosion. There are many possible causes of recurrent corneal erosion, including a history of corneal injury, such as corneal abrasion, and corneal disease. Often symptoms are first noticed upon waking in the morning. This is because when you open your eyes, your eyelids pull away the cells that have been loosened overnight. Without treatment, your eye may continue to experience this erosion. 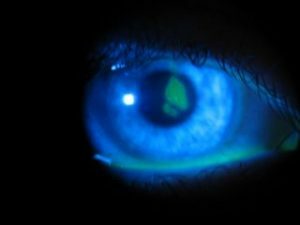 To detect and evaluate corneal erosion, eyedrops with green dye are placed in your eye. Your ophthalmologist may prescribe saline solution drops to help your epithelium adhere to the underlying tissue, and he or she also may ask you to use artificial tears to keep your eyes moist. For patients with corneal erosion caused by corneal disease, an additional procedure may be necessary to remove the epithelium or adhere it to the underlying tissue in order to encourage a better bond. Should you continue to experience recurrent corneal erosion despite conservative treatments, your ophthalmologist might suggest an additional procedure called a phototherapeutic keratectomy to remove a layer of corneal tissue with a laser. This technique is used to promote healing and good adherence of the epithelium.